Serving and enjoying caviar is a luxurious moment that will be be enjoyed even more with the right utensils. Silver spoons may look very fancy, but they actually affect the caviar's fragile flavor; Mother of Pearl does not and is very elegant as well. Mother of Pearl spoons are more in line with serving caviar according to tradition. 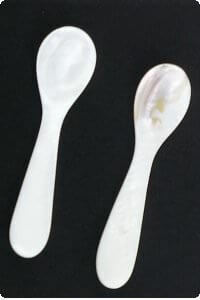 Please note that the mother of pearl spoon is a natural product, having curves and it may not appear exactly the way it does in the picture. This spoon is almost 4 inches.